Algeria has a population of around thirty five million people. 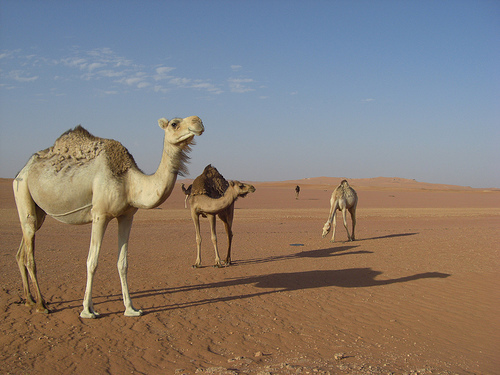 About 70% of the population lives in the coastal areas to the north, while the remaining 30% live in the oasis of the Saharan desert. About one and a half million people are nomadic or partly nomadic. Algeria has a combination of Arab ethnic groups and Berber ethnic groups. The Berbers are separated into various groups: the Kabyle are in the north central part of the country; the Chaoui are located in the eastern Altas Mountains; the Mozabites live in the M'zab valley; and the Tuareg are located in the far south. Arabs occupy the rest of the country. 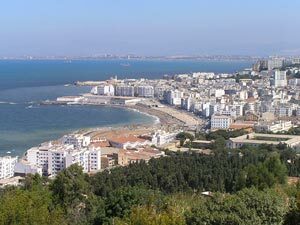 Algeria is the second largest African country and the largest country located on the Mediterranean Sea. In actual land area, Algeria is the world's eleventh largest country. The countries that border Algeria are Libya, Tunisia, Niger, Mali, Mauritania, the Western Sahara, and Morocco. The capital city is Algiers, is located on the west side of a bay on the Mediterranean Sea with a population of around 3.3 million people. The city of Algiers is divided into two parts: the older part of the city is situated on a steep hill on which sits a citadel, four hundred feet about sea level; the modern portion of the city is built near the coastline on level ground. The country of Algeria includes about one and a half million square miles of land in the northern portion of the African continent. Over 80% of the land is desert, making it virtually impossible for habitation. 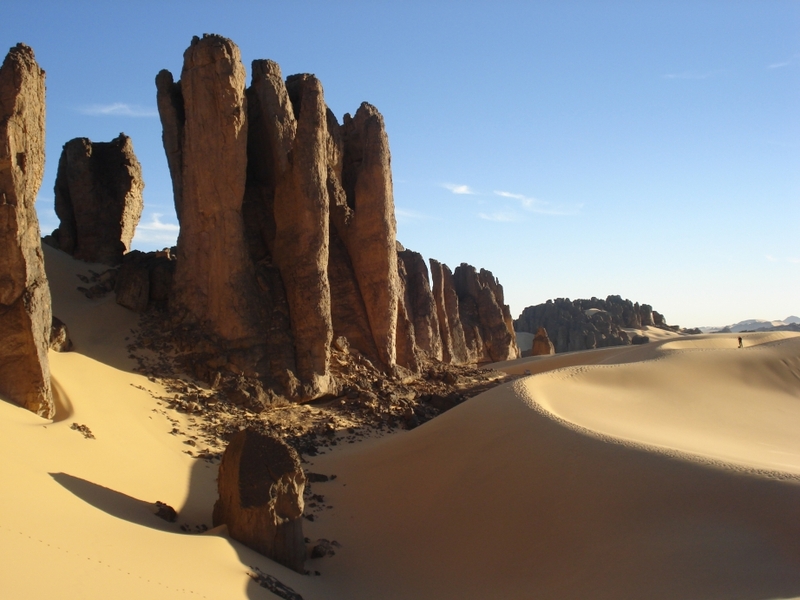 The northern section of Algeria is comprised of mountains, plateaus and valleys. The climate temperate and since it's located on the Mediterranean coast, temperatures are mild, reaching up to 80 degrees Fahrenheit in the summer and as low as 50 degrees in the winter. Rainfall is quite substantial, with as much as 40 inches in the eastern regions. The Belzma National Park in Batna Province - This 163 square mile area contains almost 450 species of flora as well as around 310 species of fauna, 59 of which are protected species. In the city of Algiers is the Kasbah of Algiers, an historic neighborhood where old buildings with the classic minarets can be seen as well as an old citadel and Moorish houses. Also located in Algiers is the Notre Dame d'Afrique, a cathedral is of French influence and a beautiful site. 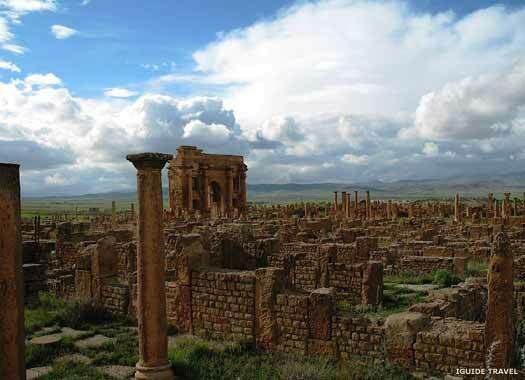 Located in Batna is the Timgad Ruins, once a Roman colonial town, in which a 3,500-seat theater is still in great condition and is used for productions. 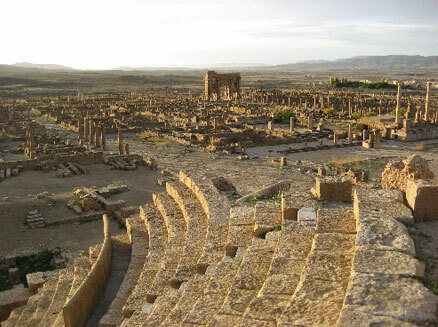 Algeria has been inhabited by the Berbers for many thousands of years. 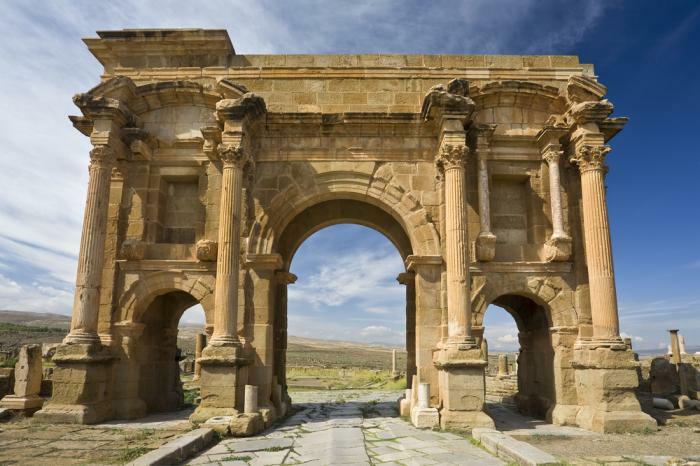 The Carthaginians began creating settlements in the coastal areas around 1,000 BC, and various Berber dynasties arose during the Middle Ages. Muslim Arab armies came and supplanted the Berber rulers and dynasties, but in time, the Spanish rampaged the Algerian coastline killing over 8,000 people in massacres in the beginning of the 16th century. Algeria came under Ottoman rule and was made a part of the Ottoman Empire in 1517. In 1830, the French invaded the country, and the ensuing violence resulted in the deaths of a third of the population. In 1954, the National Liberation Front launched a guerilla war of independence, and in 1958, then-President Charles de Gaulle of France said in a famous speech, "I have understood you." Many thought that meant that Algeria would remain under French rule, but a plebescite offered by de Gaulle resulted in total independence for Algeria. Algeria's first president, Ahmed Ben Bella was overthrown in 1965. During Ben Bella's time in power, the country became authoritarian and socialist, which continued with the following president. The current president was elected in 1999, and during his term, high prices of gas and oil are being used to improve the infrastructure and industry, and overseas investment in Algeria has also increased. Nightlife in Algeria includes both indoor and outdoor entertainment. Many of the restaurants in Algeria have outdoor seating so you can enjoy the outside atmosphere along with dinner and drinks. There are many nightclubs and bars in the country where dancing and discos are part of the nightly fare. In the city of Algiers, taking an evening walk along the shoreline can be a breathtaking experience. Women tend to be scarce in the nighttime scenery, so many of the events during the evening seem to be geared toward men. Algeria's predominant religion is Islam, serving more than 90% of the population, and most of them are Sunni. The other 10% of the population are Christian, Jewish, atheists, or other nonbelievers. During the 1960s, the Jewish community was quite prominent, however there is only a small Jewish community still living in Algiers in today's society, where the only synagogue is located. The Christian population include Catholic and evangelical Protestant. Although there is some religious freedom, Muslims cannot legally marry anyone not of the same faith. Algerian cuisine is a combination of Mediterranean and Middle Eastern styles of cooking, and the Berber communities and the Ottoman Turks have a strong influence on the cuisine as well. Algeria has an abundance of various Mediterranean fruits and vegetables as well as tropical produce that are added into meals. The main source of protein in Algeria is lamb. Other popular alternatives include fish and Mediterranean seafood. One of the main dishes in Algeria is called merguez, a spicy lamb sausage that comes from the Atlas Mountains. Typical Algerian cooking relies on the heavy use of spices. Tea and coffee are the most popular beverages. Mint tea is mainly drunk during ceremonies, accompanied by pastries, and tea is also consumed in the morning before or during breakfast. Algerians also drink a lot of coffee and the most popular type of coffee is a Turkish blend.